Please allow me a moment to introduce you to Mr. Ball Mark. Mr Mark shows up regularly on golf greens all over the world. Many times he is repaired and allowed to heal properly. Other times he is not repaired and will take weeks and maybe months to heal completely. Please take a moment and watch his debut video on the Glen Echo CC Blog! I made the first spray of the spring season to our fairways as a part of our Bermuda Eradication Program. I would expect at least one more spray in the next 30 days or so and than a little break in the program allowing the sodded areas and some pretty significant golf events to get completed and we will then spray probably 2-3 more apps in late summer/early fall. I would expect the Zoysia to turn slightly off color for about 10-14 days. My hope is that we've timed it properly to knock down some Bermuda significantly but to also reduce the amount of seed heads we will have from our Zoysia. If we are able to reduce the seed heads this will allow the zoysia to save energy that it would have used in producing seed. Lets keep our fingers crossed. I posted a video below regarding this program. Miss you girl. Beth and I had to send Lady off to the open fields of heaven today. She had become increasingly weaker from her cancer growth and was showing signs of pain. She lived a wonderful life and provided great memories for me and my family and for her golfing friends at three different facilities. I am grateful to all those facilities, the staffs and golfers who showed her much love and understanding, even when she pulled a hot dog off the seat of their cart. Lord, do I have stories. I have put together a tribute to my beautiful girl and friend. The very nice weather stats for March. Rainfall 2.29" 3.32" -1.03" 3.0"
Snowfall .3" 2.3" -2.0" .6"
The short range grass tee is now open. Long range tee will be another week or so. 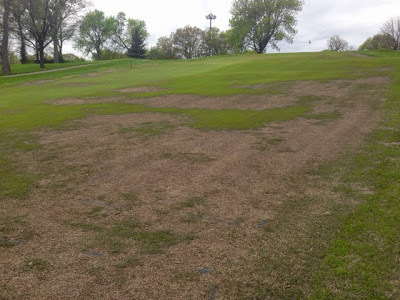 Short range tee is built on sand which allows it to warm quicker and begin growing and repairing itself a little faster. Long range also sits in a hole and its definitely colder down here but it is looking good. The staff repaired the water line for the water fountain on #14 yesterday. The leak was directly in the middle of the cart path. 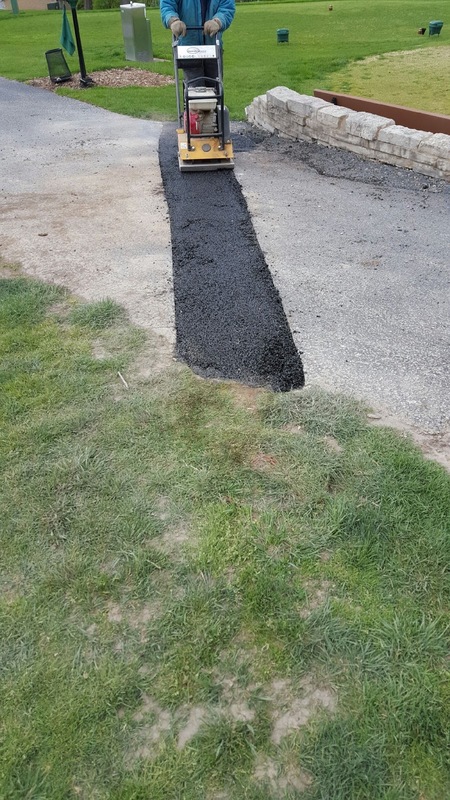 They cut the asphalt out and were able to locate the leak about 15" underground and made the repairs pretty quickly. Tom and Jason down to the dirt. Leaking metal line on the right side of the picture. 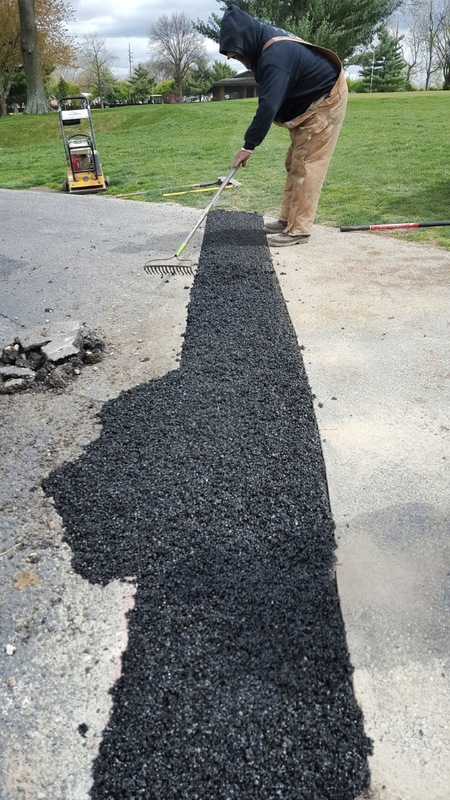 Skip touching up the new asphalt patch. Russ packing and smoothing the newly laid asphalt. At the top of hill of #7 about 50 yards from the green significant bump that developed over the last year or so in the cart path. 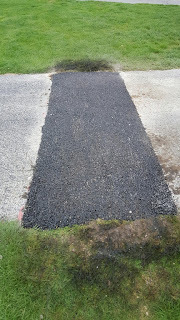 The boys cut out the asphalt and patched the area to make it smooth again. Also at the main road and 7 cart path, we have had the little path blocked off that goes up the right side of the hole. 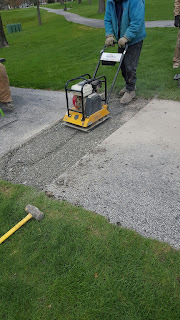 We are eliminating this cart road because of the wear and tear it creates at the beginning and up the right side of the fairway for at least 50 yards. Excessive cart traffic weakens the zoysia. We used the asphalt saw to cut a small walk path for our walking golfers to continue to use. We will be picking up the asphalt next week and will fill the area with soil and fescue sod next week. We will be placing Ornamental wood stakes with rope along the main road to block cart traffic from entering this area. We are requesting that carts use the left path and then cross the fairway. 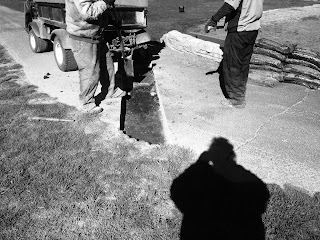 Russ tamping the new repair on hole 7. The arrows point to the new path that will be for walkers only. 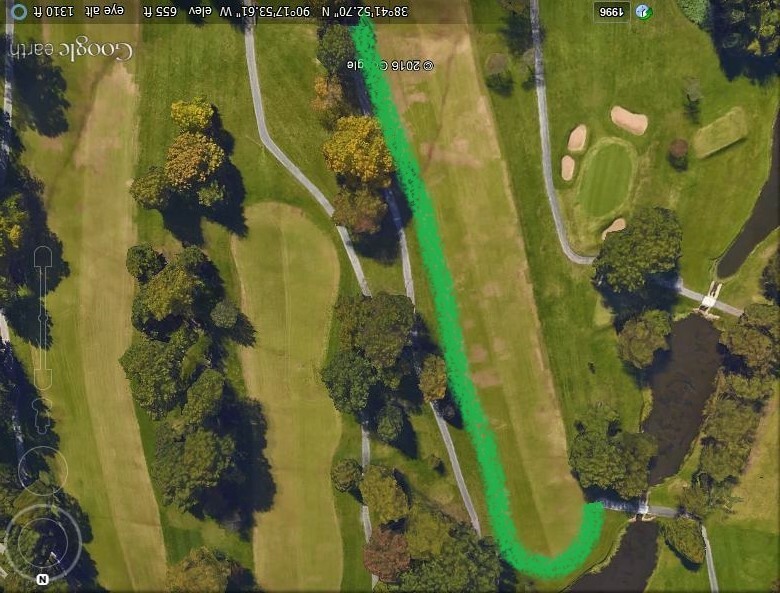 Rope and stakes will be used to direct carts to the left path on #7 near the red tee. Excessive wear at the beginning of the fairway from cart traffic is the reason for the changes. Becky has designed a new planting scheme for the Bubble Ornamental Bed. The existing bed was a bit overgrown and tired and was in need of some attention. I pulled the plant material out today, we will be tilling the area, adding soil, changing the shape of the bed, adjusting irrigation as needed, till in compost for the new bed and plant it all hopefully within the next week. Some of the perennials she planned are still growing in the greenhouse and will be delayed in their installation until they are mature enough to plant. Plants removed and now empty. You will notice some additional sod work was completed by the staff early this week. Areas repaired include the drive off near 8 green just short of the bunker. The left fairway bunker on #5 needed some replacement. There was an area to the ornamental planting as you come down the hill toward the first tee. Trees have been removed in this area but rough mowers and roughed up this spot pretty significantly over the last few years. This area had soil added and new sod. A few other spots were completed as well like the walk off area near 17. We used 480 yards of fescue sod in the last 2 weeks. Fairways and all tees were mowed early in the week. Yes it will be cold Friday night but I don't expect the temperatures will be cold enough to stop the green growth in our warm season grass. Greens continue to heal but these cold temperatures have not done us any favors. I did roll a few balls on the putting green today and our ball roll is improving noticeably since we have been able to mow a couple of times this week. We mowed and rolled today and will roll the greens again in the morning if the frost stays away and greens aren't damp. Warmer temperatures next week with early week rain should continue to move them in the right direction. Interesting article in Forbes Magazine about pesticides we come in contact with in our daily lives. Click link below. 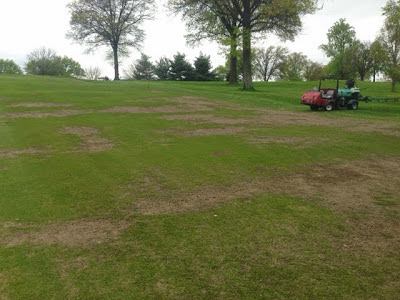 Another example of our Fairway Bermuda Eradication work on #12. View below is from Spring 2015 where we had sprayed the Bermuda the fall before with our product. The last photo shows how well the Zoysia has filled in and how the Bermuda has been slowed allowing these improvements. We will still need to spray these areas further to help suppress the Bermuda even more but the program is working well in many areas on the golf course. This was last spring looking up the hill toward 12 green. Fall 2014 spray hit the Bermuda pretty hard in this area. Some replacement last season in the larger areas. Very little Bermuda coming out right now. A great deal of the right side intermediate is Bermuda that is slowly coming out but very little if any in the main part of the fairway. This chemical applications are working very well for us. We will have to continue to do some wholesale replacements in the intermediate rough because some areas are completely void of Zoysia. Leaking Water Line, Sod Laying, Mulch Spreading, Zoysia Grass Greenup, and Stump Sodding Oh My! A number of items to cover as we go into this weekend. The weather has been really kind to us with average temperatures 6-7 degrees above normal for March. 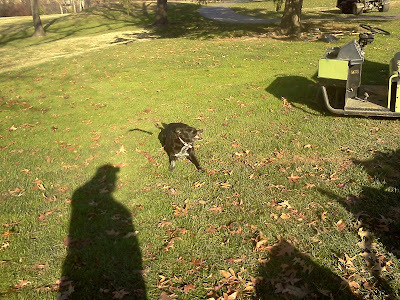 That means our warm season grass has awakened early this year. Normally we mow fairways around the 20th of April give or a take a few days. Might be a little early this year but will evaluate a little further early next week. No promises but we are looking at it closely. The staff noticed the other day a water stream above the 14th tee water fountain. Skip has investigated and believes the leak is coming from under the cart path. Sure, lets make it real difficult. We plan to cut the cart path next week and dig up the leak. The line feeds the water fountain on 14 so it is shutoff for now. Sorry for the inconvenience. The view looking down from the cart path on 14 tee. Red dots are the water line. We believe the water line is leaking from under the path. Water line comes from Lucas & Hunt. It feeds the Field Bar, goes cross country to the pro shop and to our building. 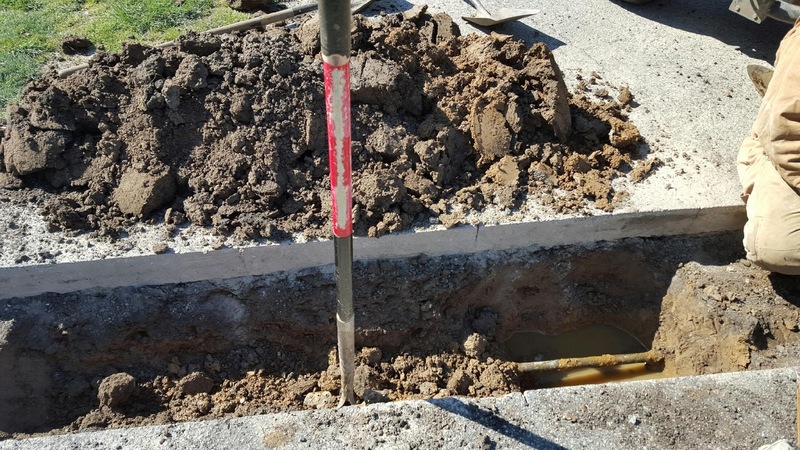 This was the original water line that fed the old clubhouse at the tennis courts. Free is always good when it comes to our department. We try to think of ways of doing things that do not require additional expenditure. One of these ways is using oak chips from the tree trimming and of course when an oak is dropped we chip those limbs as well. Its not the fanciest mulch but it works well enough in our shrub style beds like along Wallingford Drive along the short range and especially #9 Woodland Garden. We would probably need another thousand dollar load of regular mulch if we used it on these areas. Along with mulching comes continued removal of sweetgum balls. Alphonso worked all day today on about 8 different trees picking up and hauling away gumballs. Nice sized pile for us to use. You would be surprised how quickly it goes. Latrell and Randy spreading product along Wallingford. The staff spent most of the day Wednesday and part of the morning on Thursday sodding the ground stump areas on the course. We still have a few spots that we will seed in the next few days. This worked involved hauling dirt which was discussed the week before, packing it and then cutting out the edges and laying the sod. 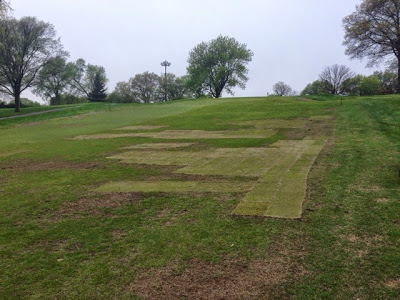 I will circle these areas in the next couple of days to allow you for a free drop from this new sod as well as warning you when driving your carts so that you will not drive over the top of them. It will take a few weeks for them to become solid and to become fully rooted. Becky came up with the idea to make some additional planters out on the course from the hollowed trees that were removed this winter like she has been using at the Field Bar the last few years. Should be a colorful addition to a few tees on the course this season. Last but not least. Greens are healing well from aeration. They were brushed and rolled today after Wednesday evenings rain. We don't do much to them except brush and roll when they are dry. 11 days since our first and 4 days since the second. If they grow enough over the next few days, we will put a mow to them next mid-week. Biggest issue effecting growth is the fact that we are in the middle of growth regulator time because of seed head development as well as trying to keep the poa annua in a stunted position with another regulator.Yes the greens are a little extra sandy but as they begin to grow through the sand this should give us some excellent smoothness to our surfaces. I would expect the greens to be in great condition for opening day coming up next Saturday for the Men and the following Tuesday for our Ladies.